20 « March « 2019 « Blog Marcos L. Mucheroni Philosophy, Noosphere and Ciberculture. 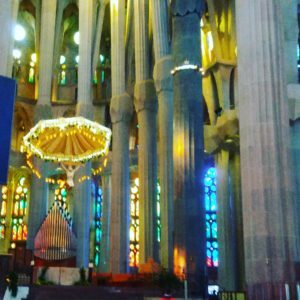 The first contact with Gaudi would not be the first post, it was the experience I did that made me reverse the post, yesterday separated them to notice the end of the conception of objective reality. Yes the historical path of these two Catalans is the reverse, in the Virtual Multimodal Gallery that I did, you can find 2 works of the last Dali that bring you closer to the current virtual universe (not objective therefore), while Gaudi had a great dialogue with Gothic and naturalism. Alias for physical reasons, Gaudi was always a vegetarian long before this was fashionable. I would say that they are complementary, but Antonio Gaudi i Cornet (1852-1926) will only impress us if we walk through his work, we feel his “aroma”, and his connection with Dali can be found in a lecture at Park Güell in 1956, for on the occasion of the feast of Mercy, the complete text in Spanish can be found on the Gaudi Club website. In this conference Dali in defending him was 52 years old, when he died he was 22 years old. Gaudi designed the interior of the cathedral in the form of a cross, in a stylized way the cross is present in all his works, the novelty of this church is that the representative biblical figures are all out of the church, inside there is a harmony of light, colors and sounds (above the picture I took) with the tube organs that were later placed, but certainly were in Gaudi’s imaginary, which we have already said has a cosmogony that goes beyond Christianity. The proposal of finalization is for the year 2026, when it will be the centenary of Dali, it is also expected his canonization by the Catholic Church, nothing more just.